The Party of European Socialists congress in Budapest re-elected Sergei Stanishev as the EU-level party’s leader after rival candidate, Spain’s Enrique Baron Crespo, withdrew from the race. Reports said that Crespo understood that he had too little support to mount a credible challenge to Stanishev, leader of PES since 2012. Of the 419 delegates entitled to vote, 407 voted and there were three spoilt ballots. According to Stanishev’s office, the vote in favour of him was 69.5 per cent, with 16.5 per cent against and 13.3 per cent abstentions. Stanishev was the longest-standing leader of the Bulgarian Socialist Party, lineal successor to the Bulgarian Communist Party, after the end of the Zhivkov era. He became BSP leader at the end of 2001 after his predecessor and then-mentor, Georgi Purvanov, was elected Bulgaria’s head of state. The BSP got the largest share of votes in the 2005 parliamentary elections but insufficient to govern alone, and Stanishev became prime minister in a tripartite coalition of the BSP, its regular coalition partner the Movement for Rights and Freedoms, and the previous governing party that had been formed around former monarch Simeon Saxe-Coburg. Stanishev was prime minister for a single term before his party was defeated in regular elections in 2009 by Boiko Borissov’s centre-right party GERB. Early elections in 2013 saw the BSP back in government in a ruling axis formed with the MRF after Borissov’s party got the most votes but could not form a government because it had no allies in that parliament. Following huge public protests against the BSP-MRF ruling axis, which held power with the support of far-right ultra-nationalists Ataka and which engendered outrage by appointing controversial figure Delyan Peevski to head the State Agency for National Security, the BSP was handed a sound thrashing in May 2014 European Parliament elections. In parallel, Stanishev’s PES ran second to the EU-level European People’s Party and there was speculation at the time that this could cost him the PES leadership. At Bulgarian level, he stepped down as BSP leader in 2014 and chose to be an MEP and not an MP. The October 2014 elections saw another defeat for a diminished BSP at the hands of GERB, which went to form a coalition government including a minority share for ABC, a breakaway party led by Purvanov who had failed in an earlier attempt to grab the BSP leadership back from Stanishev. 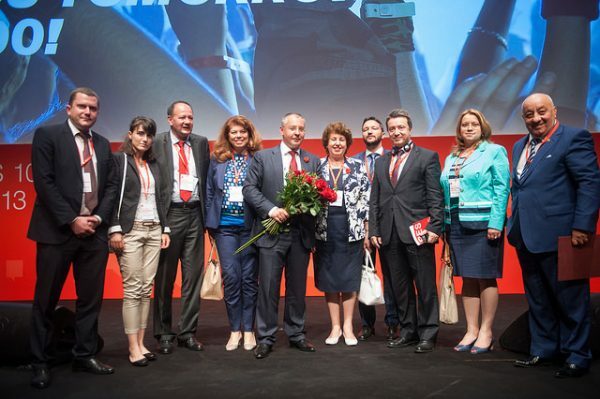 Stanishev and BSP members at the PES congress in Hungary, after his re-election as PES leader. Reports from Budapest quoted Stanishev as saying he was “happy and moved” by his re-election as PES leader, which he saw as a victory for Bulgaria and the BSP and as an expression of trust by PES member parties.